Will next summer’s The Avengers be as lively as Captain America or as leaden as Thor? 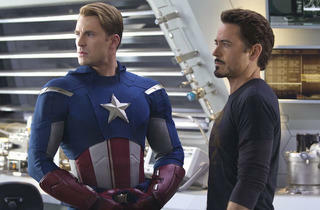 Photograph: Zade Rosenthal SUPEREGOS Expect some tension between Evans and Downey Jr. in next summer's The Avengers. Last week, Marvel Studios finally unveiled the first official trailer for The Avengers, next summer’s all-hands-on-deck superhero bonanza. This aspiring blockbuster will feature a roster culled from several of the company’s previous theatrical outings: The Incredible Hulk, both Iron Man films, and the two newest additions to the franchise family, Thor and Captain America: The First Avenger, which arrives on VOD this week. For true believers old and new, the prospect of all these titans getting together in one room inspires a rush of giddy adolescent anticipation. 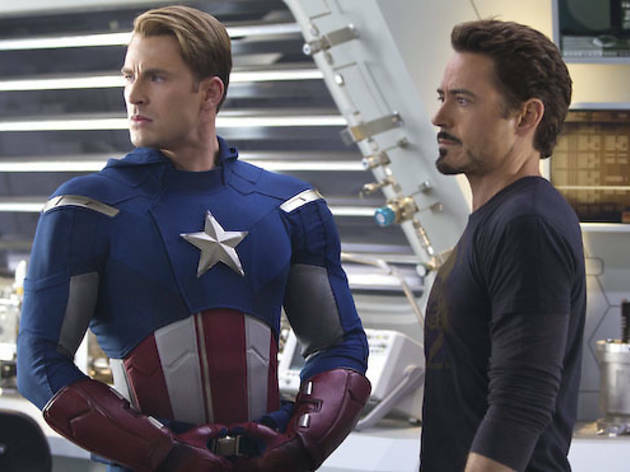 Who wouldn’t want to see Robert Downey Jr.’s sardonic Tony Stark trade barbs with Chris Evans’s pious supersoldier? The excitement fades, though, when one remembers what all this cross-franchise pollination has done to modern superhero cinema. Comic-book movies, once a reliable source of breezy, stand-alone entertainment, have become extended, glorified previews for other comic-book movies. And the Marvel business model is largely to blame. From the moment Downey’s space-age flyboy popped in for a post-credits cameo at the end of 2008’s The Incredible Hulk, the game plan was clear. Marvel, which had started producing its own adaptations with the same year’s Iron Man, was attempting to create a cinematic world populated by all the characters from its various franchises. By introducing a line of guest stars who could walk freely from one film to another—Sam Jackson’s one-eyed Nick Fury, Clark Gregg’s deadpan Agent Coulson—the studio could make each new origin story look like a sequel, a prequel and the latest chapter in some grand master narrative. That interconnectedness may please the diehards, but it does no favors to a movie like Thor, which is so burdened by obligation that it never gets off the ground. Even Iron Man 2, the lone official sequel in the new Marvel Studios canon, feels preoccupied with setting wheels into motion. There’s always an older movie to remind us about, a forthcoming movie to advertise and fan-favorite characters to reference slyly in passing. These films are like in-jokes without punch lines. Captain America may be the best of the Marvel movies, largely by virtue of being the most plainly disconnected from its predecessors. Chris Evans plays patriotic pip-squeak Steve Rogers, who gets pumped up on fast-acting steroids and becomes the ultimate one-man weapon against the Third Reich. The film takes place during the dog days of World War II; besides offering a respite from the constant S.H.I.E.L.D. cameos, the change of setting grants director Joe Johnston the opportunity to vary the visual style a little. His film’s as square-jawed as its protagonist, but it’s also entertaining in a way that its exposition-heavy brethren scarcely are. Is it foolish to assume that The Avengers, the big event movie all these little event movies have been building toward, will boast a similar spirit of unfettered fun? Will enjoying this supergroup melee depend on having trudged through all of the films leading up to it? Putting Joss Whedon behind the wheel, as writer and director, is reason to have faith. The brain behind Buffy the Vampire Slayer and Firefly, he’s the rare world-builder who understands the importance of the enthralling part and the mythic whole. Restoring playfulness and of-the-moment excitement to a genre lost to the bean counters? Now that would be a true feat of heroism. Captain America: The First Avenger arrives on VOD, DVD and Blu-ray Tuesday 25. Thor is now available on VOD, DVD and Blu-ray.